We are one the leading manufacturer and supplier of Colourful Stone Artificial Earrings with the high-quality of material used as per the industry standards. We are the manufacturer & wholesaler of American Diamond & Kundan Jewellery. 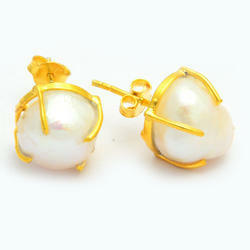 Leveraging our vast potential, we have come up with Designer Stone Earring for our priceless customers. The offered earrings are acknowledged for their breathtaking design and timeless appeal and are fancied by a large number of customers. 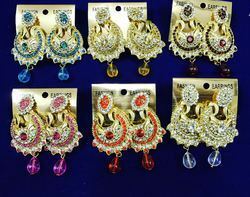 These earrings can be teamed up with both western and ethnic outfits. - Available In Different Design. Our clients can avail from us a range of Silver Precious Stone Earrings. This range of silver earrings is well suited to the clients of various age groups. These earrings are available in various designs, shapes and are well known in the market for its smooth and fine finish. Wholesale Buying minimum purchase Indian Rupee RS.5000 onward. High quality fashion jewelry made of german silver as base metal used along with lots of beautiful colored synthetic and natural stones. All stones used are faceted of high quality. A must have in your lovely collection of fashionable accessories.All designs will available in mixed lots. We Manufacture this COPPER EARRING on make to order basis choice of metal polish & colour of stones available.